The Escalante National Monument, located in southern Utah, is one of the most recently mapped locations in the 48 contiguous states of the U.S., declared protected in 1996 and consisting of the Grand Staircase, the Canyons of Escalante, and the Kaiparowits Plateau. 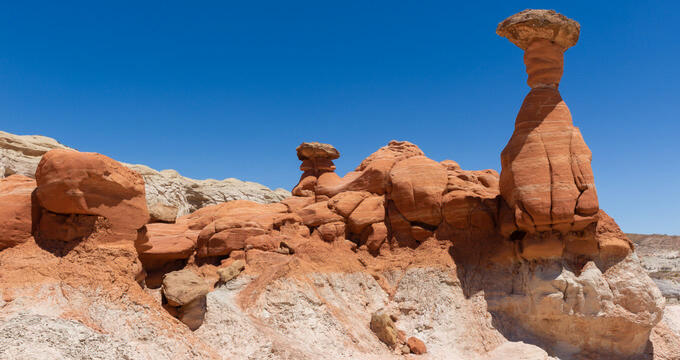 Visitors can view sweeping vistas of unique stepped erosion and ongoing excavations of previously undiscovered civilizations, stay in campgrounds of different levels of ruggedness and convenience, hike or take tours of Hell’s Backbone, Coyote Gulch, and Calf Creek Falls, go off-roading, horseback riding, and fishing. The area of the Grand Staircase Escalante National Monument was formed over the span of at least 75 million years from various processes of erosion and tectonic shifts. Plateaus of the Grant Staircase, the ridge of the Kaiparowits and the Escalante Canyons all owe their formation to ancient erosion over millions of years. Human settlement of the area began in prehistory in 500 AD, when Pueblo and Fremont peoples dwelled there. During this time the Fremont people will have been a hunter gatherer society and evidence was found that they lived approximate to the Escalante Valley. Ancestral Puebloans were a agrarian people and had their farms and homes in among the canyons. Rock art and ruins of brush houses and natural rock shelters are found in the area. Following this, it was discovered again by Colonial explorers in 1871 and then again in 1879 by the San Juan Expedition, which famously traversed the length through the use of explosives and a pulley system for the transport of their animals and wagon. Its cartography was not known by civilization until after being declared a national monument in 1996, after which began excavations, the mapping of trails, and tourism. Since then, excavations have uncovered both civilizational artifacts as well as paleontological findings of fossils dating back 75 million years. The Grand Staircase is a natural museum of ancient geological, paleontological, and civilizational history. Erosion has created a great number of canyons and interesting formations, and enthusiasts will be at no loss for hiking options. Outdoor recreation strenuous and relaxing both are in abundance throughout this 7000+ square kilometers of preserved land. The whole of the national monument area encompasses three distinct areas: Grand Staircase, Kaiparowits Plateau, and Escalante Canyon. Grand Staircase- A veritable collection of plateaus starting at Bryce Canyon and heading southward in the direction of the Grand Canyon, the Grand Staircase is a geologically progressive land formation including many high vertical drops. Herein is included the Pink Cliffs, White Cliffs, Grey Cliffs, Chocolate Cliffs and Vermillion Cliffs. Kaiparowits Plateau- Also called the Fifty Mile Mountain, the Kaiparowits Plateau stretches from Escalante all the way to Glen Canyon and its Colorado River. This is the longest, most dominant ridge of the national park and is right in the center. Ascendable from the western and southern sides, the ridge is nine thousand feet off the ground and boasts a collection of fossils from the Late Cretaceous period, still in active excavation. Canyons of the Escalante- A name for a collection of landforms carved by the Escalante River and its various tributaries, named Escalante River Basin. It is within the Escalante Canyons that the majority of hiking trails are found due to its many high canyon walls, slot canyons, rainwater sandstone depressions known as "waterpockets," domes, natural arches, hoodoos, and bridges. It spans 1,500 miles squared and reaches a height of over 11,000 ft in places, making it a major location for small ecosystems, excavations, and hiking trails for locals and tourists to get lost in. Hiking Trails- along the GSENM, hikers have many trails of varying difficulty to choose from. Hikers can take tours along many of these trails or rough it on their own, stopping at basecamps and other campgrounds along the way to rest and rejuvenate. - Golden Cathedral- Located in the aptly named Neon Canyon, the so-named Cathedral consists of three large arches carved by water runoff from a domed area above. The effect produces dramatic lighting and photogenic scenery and a pool below that is deep enough to wade and swim depending on the season. - Calf Creek Falls- This was used as a calf pen in the end of the 1800s and beginning of the 1900s and is so named. It is a massive waterfall with lush with prehistoric art and beaver ponds leading into a hidden clearing of colorful pools. - Death Hollow- Known for its drama and flair, this hiking trail stretches all the way from Boulder, Utah to Escalante River, crossing 6.6 miles and requires shuttle pickup to get started. With its striking depiction, it is so named for sharp canyons, narrow gorges, and great length. - Coyote Gulch- An extensive hike that snakes along red rocks and reaches the Escalante River in a wending pass of switchbacks. It can be taken in a single day of intense marching or enjoyed leisurely with an overnight hike. There are arches and wetlands along the way for variety and photography. - Forty-Mile Gulch- Just eastwards from Hole-in-the-Rock Road and southward from Coyote Gulch lies this mazelike trail. Full of smaller gulches and canyons that grow ever narrower, this hike has several different available routes to explore of varying difficulty. Many of the routes give an opportunity to wade and swim through the canyons and will be appealing to those who enjoy a variety of terrain to cross. - Little Death Hollow- A hike through the 8-mile-long canyon, this trail starts in a Circle Cliffs spot southward from Wolverine Petrified Wood. This takes hikers through the nearby slot canyon and has many options for hiking on both there and back. It ends somewhere in the slot canyon and most travelers turn back once they reach it. - Round Valley Draw- A slot canyon tucked away southeast from Cannonville and just inside the GSENM, this is a shorter trail that feels like spelunking for visitors, as it's partially enclosed for the bulk of the route. With high canyon walls that soar into the sky, the trail is darker and more relaxed, appropriate for a casual exploration. - Peek A Boo Slot Canyon- Peek-a-Boo Gulch is in Dry Fork on Hole-in-the-Rock Road. A slot canyon shorter than most, it does not take long to traverse and can be a more casual experience. However, it will ask its visitors to climb across some easier chutes and twists, and this will need some navigation and basic rock-scrambling. - Spooky Gulch- Not for the claustrophobic, Spooky Gulch is another smaller slot canyon that gets incredibly dark deep into the slots. For visitors who enjoy hiking through dark, short treks, this is a good one to hike along with Peek-a-Boo Gulch to create a cool, isolated loop. - Escalante River- A tributary from the Colorado River, Escalante River makes for a good wading hiking trail in dryer months as it leads from Lake Powell to Glen Canyon. During the wetter months it is used as a tubing and kayaking destination spot. Excavations- The Grand Staircase Escalante National Monument is often the site of new excavations and archaeological digs. Its discovery has yielded more ecosystem change information in relation to prehistoric eras than anywhere else on the planet. As a remote location of such immense magnitude and resources, it is an untapped frontier for education, research and exploration. Here paleontologists, geologists, historians, and archeologists continually find new discoveries. The Grand Staircase Escalante National Monument is a wide-open sandbox for celebration and exploration, and local companies celebrate local and national holidays here every year. Local cattle ranches within the wide protected zone offer cattle drive vacations for adventurous visitors to experience the rugged west. In addition, tourists can book horse riding events in advance to create special events for groups upon visiting the GSENM. Through local tour companies, visitors can book guided tours to help them find their way through the winding paths and complex trails. Tour guides are available for climbing help, navigation, and their survival and supply expertise on longer hiking trails. More informative and educational tours can be taken that take visitors through the local excavation areas where publicly viewable dinosaur fossils during excavation can be seen. Though the Grand Staircase Escalante National Monument itself does not host specific dining options, it is surrounded by the nearby towns of Glendale, Kanab, and Big water to the southwest, and stretches all the way to Boulder and Escalante up northeast. Local towns to the GSENM benefit from hiking and historical tourism to the protected site and offer many restaurants with local cuisine. At base camps, local tour companies, and within nearby towns, there are supply shops available. Here hikers can stock up on needed supplies, including the most current maps of the mazes of trails, for their long recreational journeys. In addition, fishing enthusiasts will find bait and tackle shops nearby benefitting from the tourism to the local Escalante River Basin, and Jeep rental is available for off-roading.